Da fallen zwei Dinge auf: 1. recyclen die liberalen Blogs ihre Inhalte alle wechselseitig und 2. das auch noch gleich verkehrt. Meinst Du nicht auch, dem Kerl da ein bisschen viel zu unterstellen? Dass der Tzach selbst Schwule tot sehen will und deswegen auf solche solche Meldungen abfährt ist doch überflüssige Psychologisierung. Naja, das war eine Polemik. Zumindest stimmt aber so viel daran, dass wohl der Wunsch der Vater des Gedankens war, als Tzach in seinem Blog eine Bombendrohung islamischer Fundamentalisten gegen die englische Schwulenszene gemeldet hat. Es ist zwar nicht der Wunsch, Schwule tot zu sehen (das ist die polemische Zuspitzung), aber immerhin eine politische Betrachtungsweise, in der ihr prospektives Ableben lediglich das Futter ist, mit dem sich sein Feindbild stützen lässt. 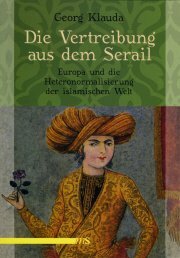 Es geht ihm nämlich, wie er in der Überschrift selbst sagt, um nichts anderes als die Kriegserklärung gegen den „Moslem im eigenen Land“. Thanks for this analysis. Tatchell is not on my christmas card list either. Last year (was it that log ago?) Outrage marched at an anti-Israel demo in London with banners that supported the Pali cause but called for the PA to clamp down on the abuse of homosexuals and lesbians in their areas of control. Outrage were then promptly attacked by other members of the demo, including most notably, but not only, Islamic groups there. (I would guess that any threats may have started then if they are linked in any way at all to this) Outrage do not seem to have learnt from this and tend to attach themselves to any „left“ protest to raise awareness for their cause without any overview of which side their bread is buttered. Certainly the gay scene has been the victim of fascist political activity in the UK such as the far right nailbomber a few years ago in London and homophobia certainly is an issue still in the UK, especially smaller towns. That Tatchill decides to make his threatening phone calls public at this time is certainly not helping anyone and will be regarded as a cheap publicity stunt by most, especially in respect of his demands for CCTV and thorough checks. This will not make people feel good about going to such clubs and its worth noting that areas such as London, Birmingham, Manchester and Leeds for example are well known not only for their large muslim minorities but also for their gay scenes. Of course this isnt always a tolerant understanding between these groups but I have not heard of a single terror threat or attack against any of these clubs, pubs or in Manchester`s case a whole area of the city. The terror attacks in London are purposefully targetting economic centres, workers and transport links (pehaps also areas where different ethnic communities live alongside one another). Although those that are planning, carrying out and supporting these attacks probably have no tolerance for homosexuals, lesbians or any other type of sexual freedom and sexuality there does not seem to be any specific threat to the LGB scene at present. Tatchill is, as you rightly point out, is just using this to boost his own media image. Thank you, Andy. I always enjoy your comments. It’s sometimes hard to judge from the outside how seriously the British public takes a political hysteric like Peter Tatchell (this is not meant as a psychiatric diagnosis, but rather as a characterization of his deliberate rhetoric). OutRage! is very vociferous, but as far as I know most lesbians and gays in Britain cling to Stonewall, if they do cling to any civil rights organisation at all, and are rather embarrassed by Mr Tatchell’s predilection for strong words (such as „apartheid“, „fascism“, and „appeasement“), which he seems to use just as a matter of principle. Ein düsterer, kalter Novembersonntag in London. Ich treffe Peter Tatchell in seiner Wohnung im Südosten Londons, nicht gerade eins der schicken Viertel. An der Tür zu seinem winzigen Apartment kein Name, dafür Kritzeleien von fremder Hand: „gay“, „queer“ und ähnliches lese ich. Seine Wohnung sei bereits mehrmals das Ziel von schwulenfeindlichen Angriffen gewesen, erläutert er später, zerbrochene Fensterscheiben hat er nicht erst einmal ersetzen müssen und zeitweilig stand er unter polizeilichem Schutz. Etwa einmal pro Monat wird er auf der Straße verbal oder auch tätlich angegriffen. Weil er immer wieder in den Medien zu sehen ist, ist er für viele Schwulenhasser zur personifizierten Zielscheibe geworden. His masculine insecurities and ambivalence towards women fit the archetype of a repressed gay man and point to latent homosexuality. After the death of his father, when Malcolm was six, he lacked male role models and was dominated by strong women — in particular, his tyrannical mother. He feared women and his early sexual experiences with girls were mostly unsatisfactory. Far from macho, Malcolm hated fighting and got beaten by other men. His passionate assertion that the need to feel masculine is a man’s „greatest urge“ indicates someone doubtful of his own manliness. Strong, tyrannical mother, fear of women, incapability to compete sexually with other men — I‘m sure in the 1960’s this would have passed as a scientific explanation of homosexuality, then understood as „moral insanity“ and „sickness of the mind“. But nowadays you will hardly find a serious psychologist who dares subscribe to any of the above hypotheses. Perhaps we should pool our resources to pay Mr Tatchell a monthly pension for all his noble efforts … provided that he spend the remainder of his life at a beautiful beach resort somewhere in Florida.